Plants have always played a central role in Sylvie’s life. On arriving in San Francisco in 1999, Sylvie, who hailed from the museum community, got work as a florist. She quickly became enthralled by the plant world and decided to specialize in herbalism and aromatherapy. In short order, she cultivated an interested in medicinal plants and began experimenting to unearth their effects on her personal wellbeing. Learning how to make her own skin care products was a revelation. Today, plants imbue every facet of her life on a daily basis: her surroundings, studies, leisure activities and the time she takes to relax and replenish her energy. Sylvie was always someone who used very few, if any, commercial creams, as her skin reacts poorly to them. She prefers the simplicity of her own products and the purity of their ingredients. That was why she created her first creams, ointments and other skin care products. She enjoyed sharing them with her friends and family, and they just couldn’t get enough of them. The outcome of her research work, always in harmony with nature, the Sylvie B. product range features skin care products Sylvie B. prepares by hand in small batches with the utmost care. They are made exclusively with high-quality, environment-friendly natural ingredients in Montreal’s Notre-Dame-de-Grâce (NDG) borough. Sylvie B. Nourishing Calendula and Aloe Cream and Herbal Ointment are must-haves in every medicine cabinet. For the past 15 years, these products have followed Sylvie in her travels, and there are always some in her fridge. The lip balm on its own is enough to keep lips soft and hydrated, season after season. 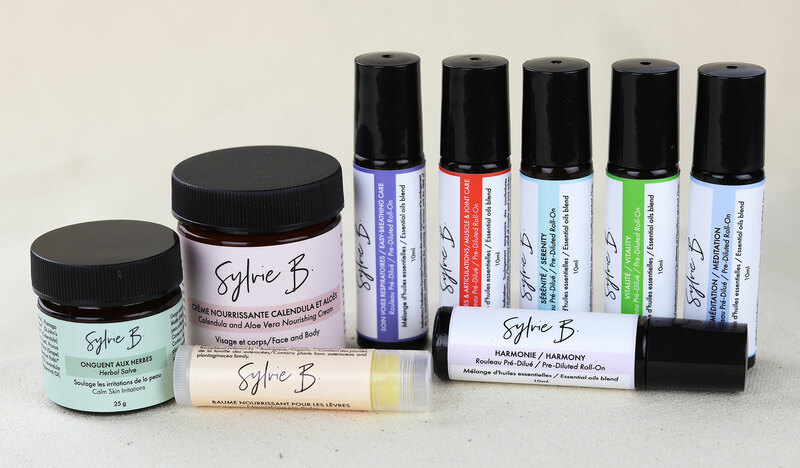 The Sylvie B. product range can be used every day. The roll-ons are designed for easy application and quick relief. Accessible at your fingertips, they slip into a pocket or purse and accompany you throughout your day. They are composed of therapeutic grade essential oil blends in natural coconut oil, which minimizes the risk of allergies and maximizes absorption. Each dried, organically grown plant (plantain, chickweed, hypericum and calendula) is macerated separately according to the traditional method using primarily grapeseed and sweet almond oil, as well as olive oil. The macerating plants are exposed to the sun for two months in order to extract their beneficial properties and then filtered. The resulting concentrated oil then forms the basis of my products. The waters (aloe, rose, etc.) and oils (plant-based oils, shea and cocoa butters, etc.) are blended at the same temperature to create an emulsion that yields a smooth cream. To make the ointment and lip balm, I combine the oils and plant butters and solidify them with beeswax and shea butter.